Marysville firefighter Mike Best prepares equipment for the journey south to Raleigh. The City of Marysville is sending four firefighters, including Fire Chief Jay Riley, to help with hurricane relief efforts in North Carolina. As Hurricane Florence bears down on the Carolinas, rescue crews from around the country are heading out to help. And as of Tuesday, that includes the Marysville Fire Department. Riley, along with firefighters Mike Best, Adam Lybarger and Mike Montgomery, are heading to a staging area in Raleigh, North Carolina, this morning. Florence has been coming in from the Atlantic Ocean over the past week. According to the National Weather Service’s (NWS) website, eastern and central North Carolina will be subject to high winds, flash flooding, tornados and power outages starting Thursday. “Life-threatening, catastrophic flash flooding and significant river flooding is likely over portions of the Carolinas and Mid-Atlantic states from late this week into early next week,” states a briefing on the NWS website. Riley said Raleigh is projected to get up to 40 inches of rain. “That would be catastrophic to any community,” Riley said. Riley said he and his team will be helping for up to 10 days, possibly shorter depending on the severity of the storm. He said that time will be a learning experience for them. While all four Marysville firefighters are on the city’s water rescue team, none of them have done hurricane relief work before. According to Riley, he expects their next several days to include water rescue using boats. Riley noted there will still be members of the city’s water rescue team staying behind, available if they’re needed while the others are away. Riley said hopefully he and his team will be able to use what they learn in North Carolina back home. Union County is prone to flooding, and having experience working in a hurricane could prove helpful. “Flooding’s one of the big risks that we have,” Riley said. According to Riley, he and his men are being sent as part of a mutual aid program within the Ohio Emergency Management Agency (EMA). 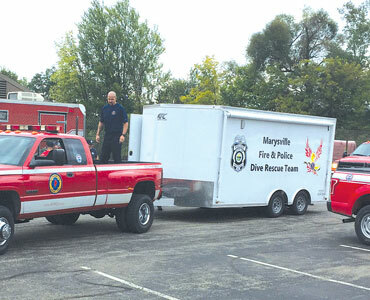 Marysville’s firefighters are making up a quarter of the 16-person team from Central Ohio. He said his team has received a lot of help from both the state and local EMA. The state is providing them with a tent to sleep in, while the Union County EMA is giving them cots. All the expenses, including manhours, of the trip are reimbursable by the State of North Carolina. “There’s no impact on local tax dollars,” Riley said. Riley said he’s not sure where the team will work. The staging area might be in Raleigh, but the work will be done wherever help is needed.